Hi there! I interrupt the regularly scheduled super girly handmade card to share with you something a little more simple and masculine. We all need Valentines for the fellas in our life. Am I right, ladies? ;) I recently felt the urge to create a few simple cards, so my next blog posts will be sharing those. Don't worry though, I'll be right back to making frilly cards in a jiff. I'm just sure of it. This card was created using the Lawn Fawn Clear to See and Say Cheese clear stamp sets. 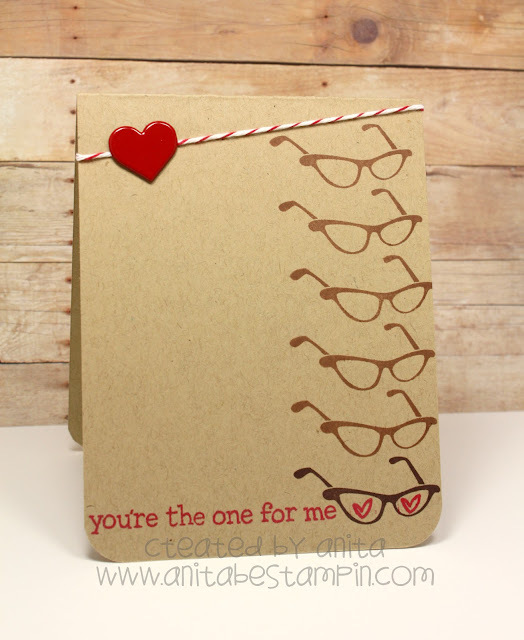 I cut the little heart apart from a sentiment stamp in the Say Cheese set so that it could be stamped inside the lenses of the eyeglasses image from the Clear to See stamp set. A little bit of Cherry Divine Twine was added along with an ancient jumbo heart brad from Hobby Lobby. I think my manly Valentine turned out pretty handsome, but what do you think? 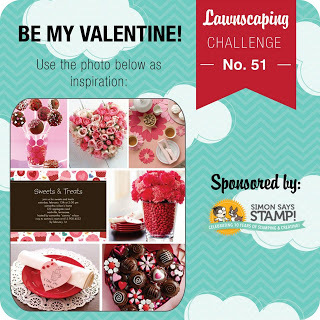 I plan to enter this "guy" in Lawnscaping Challenge #51. This is soooo darling! LOVE!!! I LOVE this card! So perfect for a guy! Love how you added the hearts in the glasses at the bottom. Thanks for playing with us at Lawnscaping! anita, this is an adorable card!! love the repetitive shape and kraft. thank you for playing a long with us at lawnscaping! Love your fun card! Congrats on being named "Top Mow it All"!